The new third edition of Chinese Tea shares the ancient culture of Chinese tea, the trade, tradition, literature, philosophy, and ceremony associated with tea in China and its popularization around the world. Centuries before the Indians or the British began their love affair with tea, the Chinese had made the ancient brew an integral part of daily life. That tradition continues today. Regardless of class or ethnicity, almost every Chinese worker carries a lidded mug in which a handful of tea is steeping in hot water. The southern provinces in particular have a time-honored culture of tea. 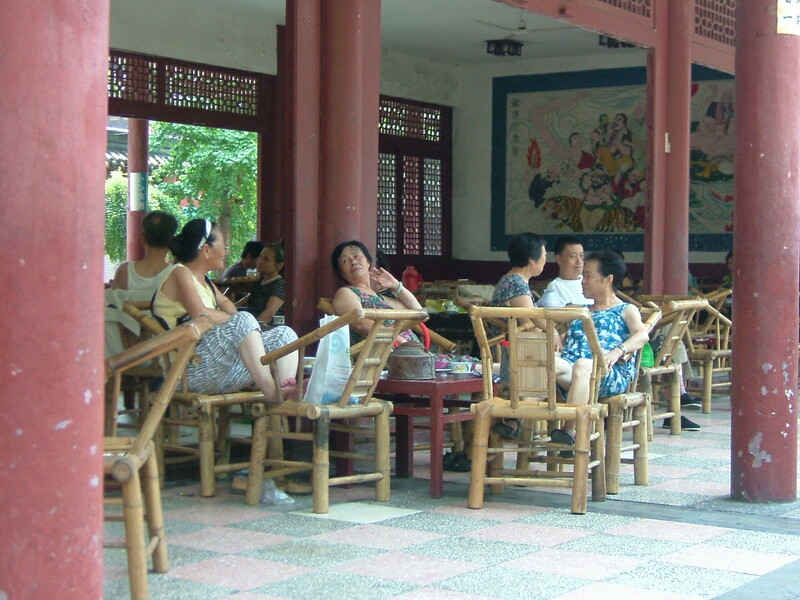 Locals enjoy their tea at the village teahouse as they have done for more than a thousand years. Records show that when Hangzhou was the imperial capital during the Song (969-1279) period, the upper classes would take music lessons at teahouses. In modern Hangzhou teahouses, elderly bird-keepers can typically be seen sitting in a circle while swapping stories over tea brought from home. Patrons relax at teahouse inside Wenshu Temple in Chengdu. Perhaps the history of tea in China is most evident in the teahouses of Sichuan, the area considered the cradle of Chinese tea-making. 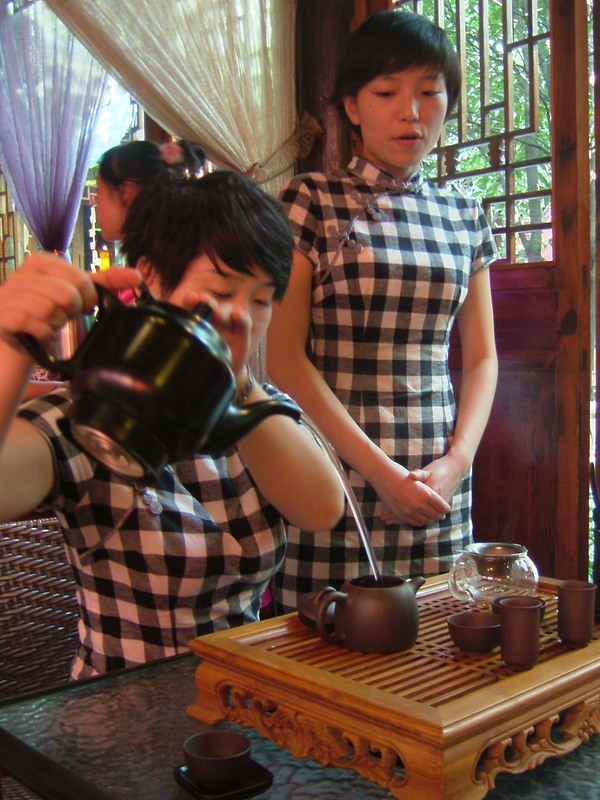 In the provincial capital of Chengdu, a variety of teahouses allude to their once important role in local society. Some attract crowds who have gathered to play cards or mahjong. Groups of retirees gather at outdoor teahouses located inside temple grounds to lounge in bamboo chairs, chat and chew nuts. More refined establishments employ men who perform a complicated series of moves while pouring tea from a long-spouted pot. 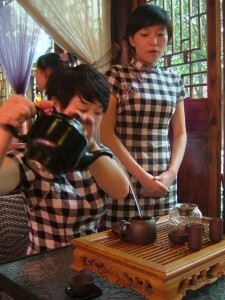 Women at such teahouses prepare tea in the traditional manner, heating utensils by pouring 90 degree water over them. The correct preparation is said to give the tea a better flavor. “The pottery is as porous as human skin and must be prepared in the right way,” explains a tea maid at Hua Jian Teahouse in central Chengdu. One of the worst things a person making tea can do is to touch the tea leaves with bare skin rather than the utensils. “This will ruin the leaves and spoil the flavor,” she says. Present day China is said to have six major types of tea, but all have their starting point in a brew far removed from today’s varieties. Tea leaves were first thought to be used in the Sichuan area around 200AD in a mixture of ingredients including salt, citrus peel or ginger that was mashed and boiled. But the spread of tea drinking reportedly began with the Buddhist monks of the Sui (581-618) and Tang (618-907) periods, who used the beverage to stay awake during meditation. Tea plantations soon appeared beside most Buddhist temples in mountainous regions and the practice soon took hold among laypeople. The Tang period also marks the beginning of the “tea policy” that regulated the monopoly of the tea trade with foreigners. The bartering item of choice was “barbarian” horses at first, but by the time Europeans sought to trade for tea in the early seventeenth century the price of tea had to be paid in gold, silver or copper. The Chinese also kept the techniques of tea growing and processing a strict secret, even to the extent of boiling any seeds sold to outsiders to render them sterile. Tea preparation at a traditional Chinese teahouse. The British East India Company had always struggled with payments in precious metals, and so hatched a plan to send botanists to steal the secrets of tea-growing and transplant the industry to India. The purchase of tea plants was forbidden by the Chinese government, as was travel by any foreigner of more than a day’s journey from treaty ports. The two most successful company agents were J.C. Gordon, who collected over 80,000 tea seeds and sent them to India where they produced the first Assam strains, and Robert Fortune, who travelled undercover in Mandarin dress for three years deep in the Chinese interior. Fortune used portable greenhouses to carry his contraband seedlings to Darjeeling. Although the zenith of the Chinese teahouse culture had passed by the early twentieth century, records show that even in 1939, Chengdu had 599 teahouses for 667 streets – almost one teahouse on every street. Men used these locations to conduct business transactions or finalize deals. After the Communist Revolution, the teahouse served as a key information exchange where people gathered for the latest news, but the spread of television and then the internet has undermined this social function. Rapid urbanization in Chengdu and other cities with a traditional teahouse culture has swept away many of the picturesque old streets and wooden buildings. But the revitalization of some areas with boutique teahouses for the tourist trade allows both locals and visitors a taste of the origins of one of the world’s most important beverages. 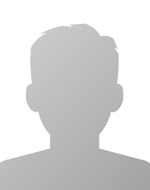 About the Author: Bennett R.